This mini spot light with high bright LED is your ideal choice for good illumination and both indoor outdoor decoration. What are you waiting for? Just come and enjoy! AC90-240V wide input voltage, be suitable for different areas. 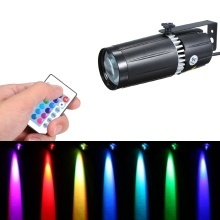 Flexible remote control for 16 different lighting colors and 4 flexible dynamic lighting modes( flash/ strobe/ fade/ smooth), 10-15 meters long control distance with IR technology controller. Convex mirror which is divergent strongly provides you wide illumination angle and range. Single mounting brackets for optional placement, like hanging on truss, installing on a wall or putting on the ground and you can adjust its angle for perfect illumination. Just plug and play, easy to handle and user-friendly. Mini size and light weight, you can carry it easily. Perfect for DJ show, bar, club, stage etc.